A number of approaches have been taken to studying the role of drowsiness in motor vehicle crashes and the characteristics of drivers involved in such crashes. This study questioned a large sample of drivers involved in both sleep-related and non-sleep-related crashes soon after the crash. The study uses a case-control research design. Cases for the study were drivers involved in recent police-reported crashes in North Carolina whose physical condition at the time of the crash was identified as either "asleep" or "fatigued" by the investigating officer. These case drivers are compared to two different populations of control drivers: (1) drivers involved in recent police-reported crashes in North Carolina who were not identified as asleep or fatigued, and (2) a second sample of non-crash-involved North Carolina drivers. All three populations of drivers were contacted for telephone interviews. Drivers were questioned about the perceived importance of drowsiness as a causal factor in motor vehicle crashes; their work and sleep schedules; the quality of their sleep; their usual level of daytime sleepiness; their driving exposure; measures they may take to reduce their likelihood of involvement in a drowsy driving crash; and, for the crash-involved drivers, the specific circumstances surrounding their recent crash. The survey results are analyzed both descriptively and by using multiple logistic regression models. Results suggest that the public perceives drowsy driving to be a somewhat less important cause of motor vehicle crashes than alcohol, but more important than poor weather conditions, speeding, or driver inexperience, and about equal in importance with aggressive driving. Work and sleep schedules were both strongly associated with involvement in a sleep-related crash. Drivers in sleep and fatigue crashes were more likely to report difficulties falling or staying asleep and were more likely to rate the overall quality of their sleep as "poor" or "fair". 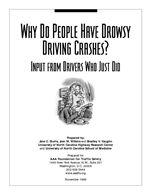 While most drivers agreed with the police officer's assessment of the role of sleepiness or fatigue in their crash, not all reported feeling drowsy before crashing.